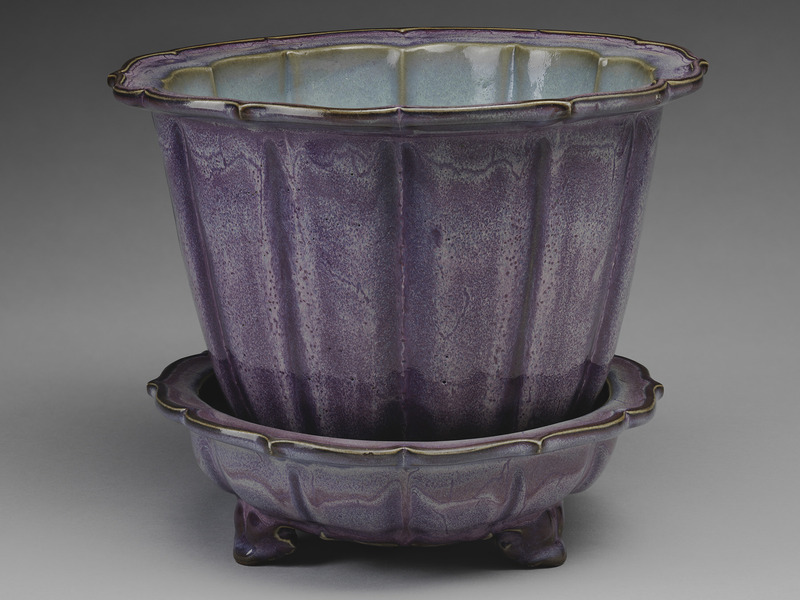 Even the Qing emperors, nearly four centuries ago, recognized Song dynasty (960-1279) Jun ware—a distinctive opalescent blue, sometimes splashed with organic-seeming, almost foliate lobes of plum—as one of the five great achievements of China’s astonishing ceramic legacy. In contemporary perspective, Jun techniques in fact persisted much longer, at least into the Ming era (1368-1644): the fourteenth and fifteenth centuries. One unusual set of such vessels is the subject of Harvard Art Museums’ exhibition “Adorning the Inner Court,” on display through August 13. For his fiftieth reunion, Ernest B. Dane, A.B. 1892, and his wife, Helen Pratt Dane, donated a ceramic and jade collection to the museum, including 60 pieces of “Numbered Jun” ware: various lobed and rectangular pots (with holes to drain water) and footed basins, mostly. All are numbered (1 for largest, 10 for smallest), and from inscriptions on the bottom, imperial collection catalogs, and scenes in a few paintings, they appear to have been used for growing bulbs and small plants in the Forbidden City. Dworsky associate curator of Chinese art Melissa Moy, who began studying the pieces (about half of which are exhibited) for her master’s thesis, notes that some of the inscriptions tie to the Hall of Mental Cultivation and other rooms in the palace. Lobed stoneware flowerpot with bracketed foliate rim; this x-ray shows concentric rings, revealing that the pots were first thrown on a wheel before being finished in a mold which gave the precise, aligned shape—a key to suggesting that the period of manufacture was probably the fifteenth century, when this technique was in use. …with the treated areas repainted. Optical microscope imaging of a sample of red glaze reveals metallic-looking particles, rich in copper. The museums’ analyses have demonstrated that some of the color effects seen in the finished wares come from particles scattering light at different wavelengths—a structural effect—rather than from pigmentation. Despite that evidence, mysteries abound. The dating of the work is imprecise, and the methods of manufacture resist modern replication. The precise modeling (exact alignment of interior and exterior indentations), perfection of shapes (see the lobed flowerpot and basin, at top) , and forms (such as the vase, below right), Moy says, suggest the late fourteenth century, when Ming ceramicists began using dual interior and exterior molds. Demand would have arisen from construction of the Forbidden City. But there are few objects to study and compare (Harvard’s collection of the numbered ware is the largest outside Beijing and Taipei). Susan Costello, associate conservator of objects and sculpture, has x-rayed all 60 specimens. Swirls and striations under the glaze reveal that they were wheel-thrown before finishing in the molds. (She has also done masterly restoration of some samples.) The stoneware pieces were fired at high temperatures (1,200 degrees centigrade). Iron in the clay helped to produce the blue or green; copper oxide or metallic copper produced the plum or red. Beal Family postdoctoral fellow in conservation science Lucy Cooper has used x-ray fluorescence and a scanning electron microscope to see how the thickness of the glazes and their firing affect the result: tiny globules of glass in the glaze, smaller than the wavelength of blue light, scatter that color; what viewers see is primarily structural, not a pigment effect. More remains to be learned about the relative chemical composition of clay and glaze, and variances in firing, to fully understand the product. That essential science aside, modern viewers, like Ming collectors or the diligent Danes, can see the plainly ravishing result. Harvrd Art Museums has launched an online resource, Numbered Jun Ware Special Collection , that explores the collection’s many complexities through descriptive summaries of its typology, technical characteristics, controversies, and collecting history, accompanied by a selection of representative images. For related gallery talks, in English and Mandarin Chinese, to be given throughout the duration of the exhibition, check the museums’ calendar .